The above quote, often attributed to Bertrand Russell, keeps ringing in my head. I first saw it this morning on a friend’s Facebook page (that’s where everything seems to be these days). And I couldn’t get it out of my head. I’m not sure if you’ve heard about what’s happened in Bangkok. I don’t want to go into details. I don’t really know what exactly happened. But suffice to know that – in a further escalation of previously peaceful anti-government protests – shots were fired, many were killed, and more injured. As I write, protesters persist in demonstrating against the government, making a myriad of demands. I’m not going to comment on these demands, nor on the legitimacy of the current elected government widely perceived as a puppet government for Thailand’s exiled former Prime Minister, Mr. Shinawatra. It saddens me to see floods of Facebook posts that are violent and vocal expressions of hatred – hatred of the PM, Mr. Shinawatra’s younger sister Yingluck, hatred of the protest leader Mr. Suthep, hatred of the yellow-shirts, hatred of the red-shirts, hatred of the police, hatred of the royal establishment. The hate list seems to go on, endless and vindictive. It saddens me even more to see floods of Facebook posts confirming, condemning, and extolling pieces of information, the truth of which is simply unverifiable. At least not now. Not without a thorough investigation by the police and other relevant authorities. How can people so readily and confidently believe one piece of information over another? In a situation of chaos and sporadic violence, information abounds. Two people at the same scene may see different things, and therefore report different things to their networks. These two reports may contradict each other. It doesn’t mean one person is lying and not another. It just means they saw – and therefore believed – different things. Which brings me to my point: events v.s. facts. There is a small, but crucial, difference between the two. An ‘event’ is something that happens. A ‘fact’ is a report of that event through whichever medium. To refer to the example above, event ‘A’ happens at the scene. Two people – let’s call them 1 and 2 – see event ‘A’. Person 1 interprets ‘A’ in one way, and tells the story of the event to their friends, thus giving birth to fact ‘A1’. This fact ‘A1’ then gets diffused to a significant number of people, all of whom take fact ‘A1’ as an accurate report of event ‘A’. Now, things aren’t so simple. Person 2 also saw ‘A’. But they didn’t interpret the event in the same way as Person 1. Maybe Person 2 had a better view. Maybe Person 2 was there for longer, so knew more of what happened prior to and following event ‘A’. Person 2 recounts the event to their friends, thus giving birth to fact ‘A2’. Is Person 1 lying? No. Is Person 2 lying? No. Did they witness the same event? Yes. Are the ‘facts’ they reproduced the same? No. Events are objective. They are just things that occur. Facts, on the other hand, are subjective. As facts are by definition reports of events, they must necessarily be subjective. The information you receive cannot go back out without passing through your brain, which processes the information (the event) and produces an interpretation (the fact), which you then relate to other people – be it verbally or in written form. 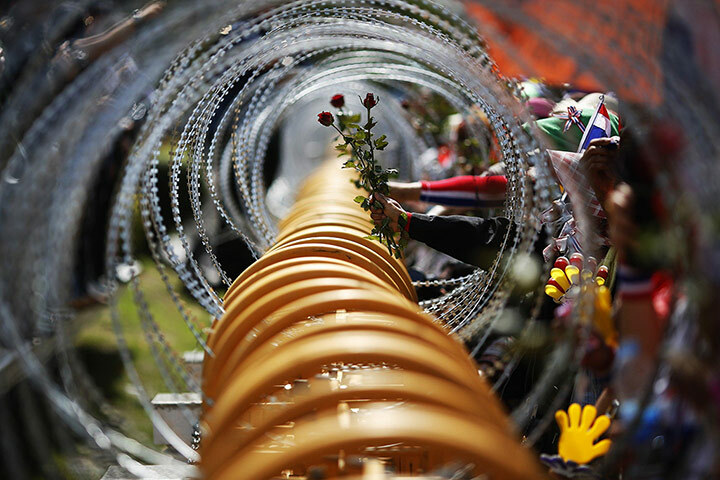 I think the public’s inability – be it from ignorance or reluctance – to distinguish between events and facts is one of the main reasons we’re stuck in this whirlpool of Thai political drama. It’s a fine distinction, yet crucial. So very crucial. Without the ability to distinguish between the two, you label every fact as either ‘true’ or ‘false’. So the facts reported by your side are true, and those reported by the other side necessarily false. The world ain’t so simple. Sorry. I’ve seen this mistake made by so many people on all sides of the Thai political spectrum. This saddens me. I didn’t want to write yet another post on politics. But here I am. I am one voice. But I’d like to think it’s a voice of reason. And the more voices of reason out there to drown out the cries of hatred and false convictions, the better. [T]he public use of one’s reason must be free at all times, and this alone can bring enlightenment to mankind. Surprisingly, those saying this (having this as their party’s slogan) have tried to either distort some truths or hide them under the carpet. Recent events indicate more people need to read this. Though recent events also indicate they probably won’t understand. Urgh.